The first museum grade 44 Truck for South Bronx. Hand-crafted using over 820 intricate, true-to-scale parts. From the stokes basket and water cooler to the authentic 44 Truck graphics, this 1:50 scale replica emulates Tower Ladder 44. Our goal with each release is that our customers may notice something new each time they view the model. Razor sharp, stainless steel precision. 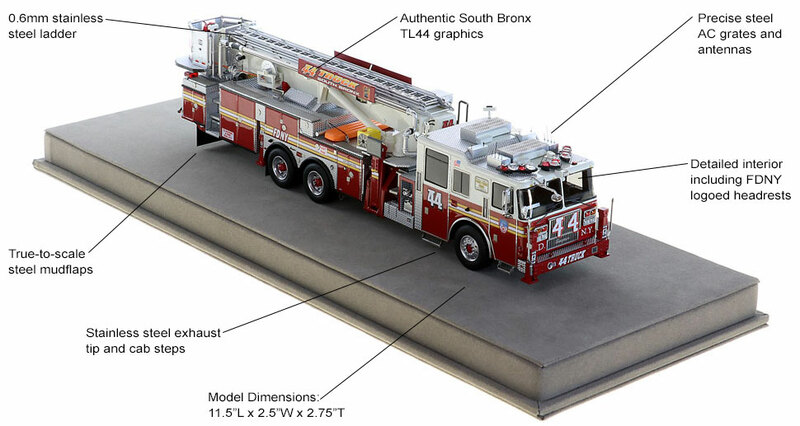 Tower Ladder 44 features impeccable detailing and true-to-scale parts that only stainless steel can provide. 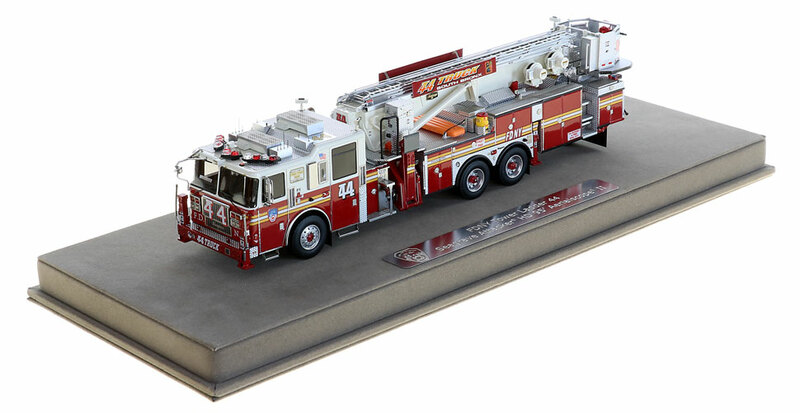 Fire Replicas has ushered in a new standard in 1:50 scale modeling that is sure to impress the most discriminating collectors. Extremely limited production for lasting value. Only 125 units of Tower Ladder 44 have been produced. Fire Replicas are designed with the elite collector in mind, and manufactured in limited quantities to enhance long-term value. FDNY...preserved with pride and professionalism. 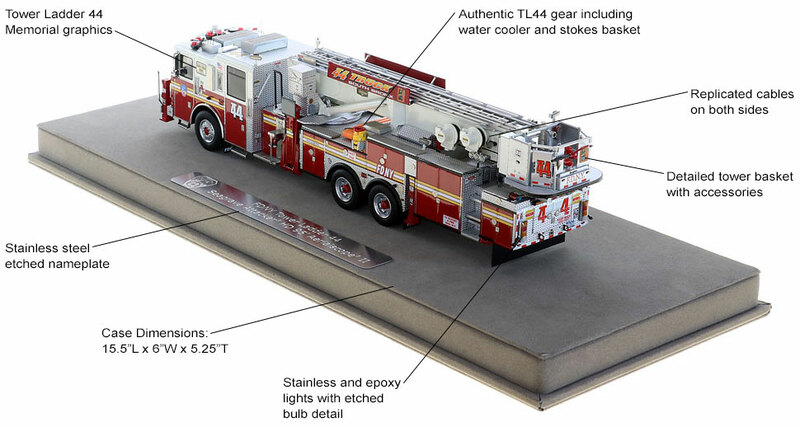 The FDNY TL44 measures 11.5"L x 2.5"W x 3"T and is securely displayed inside a custom case. The case dimensions are 15.25"L x 6"W x 5.25"T and the platform includes an etched stainless steel nameplate with the FDNY seal, department and truck name. This FDNY Tower Ladder 44, a 95' Aerialscope II on an Attacker chassis is a museum grade replica. Like all Fire Replicas models, every detail is modeled to perfection and with razor sharp precision. The replica features the specific department configuration and graphics, leaving no detail overlooked. The display case is custom manufactured with high quality acrylic and resin. The stainless steel etched plate features the department and truck name, and department seal. This replica is a treasure to be displayed and admired and is in no way a toy. The FWD Seagrave team is dedicated to providing highly engineered heavy duty vehicles, cabs, chassis, bodies, aerial ladders and other products with superior lifetime value for our customers by concentrating on innovation and continuous process improvements. As a single source manufacturer, we integrate design, construction and assembly under one roof. The result is an apparatus built for best lifetime value that operates under the most severe conditions. One of our unique manufacturing distinctions is our life-saving “safety cage” cab design, which has earned us an unmatched reputation for dependability under the toughest of conditions. The cab’s cage design is the hallmark of occupant safety. Models get better everytime! The detail is unreal! This will be my 4th fire replica and everytime I am even more impressed. There was no detail that had been missed! This model looks so real. The detail is awesome. It is better than the first 95' TL that was produced a few years ago. Keep up the good work Fire Replicas. By far the best model and most detailed ever made. Fire replicas is the best replica company in buisness. Awesome unit. So much that I gifted one and ordered one for myself. Another winner from Fire Replicas. The details on this one are awesome. Every graphic is totally accurate to the real rig. The placement of the stokes basket is exact to the real thing. Get this one quick before it’s gone. 5 stars !!! Many collectors missed out on the original three FDNY 95’ Seagrave TL’s from Fire Replicas and it is great to see Fire Replicas add new FDNY 95’ Attacker HD’s to their line-up, TL14 was released a few weeks ago and now we get another winner in TL44 from the Bronx. The new 95’ TL’s are 100% brand new and TL44 has many improvements in detail and quality from the original 95 footers. This is hard to believe given how great the initial trio were. The overall fit and finish is fantastic and the bucket area is especially crisp, clean and detailed. The South Bronx graphics look great, as does the large 44 on the front grille. The additional details such as the water cooler and stokes basket really make this model stand out. The use of stainless steel components such as AC grating, true-to-scale ladder, and awesome Seagrave grille look great on this model. Only 125 have been produced so don’t miss out.